It is indeed a pleasant and privileged occasion for me to join you on the occasion of the first Convocation of the Indian Institute of Management (IIM), Kashipur, which was founded three years back. As the first batch of 37 Post Graduate Programme students complete their management degree course today, the Institute should pride itself on crossing a major milestone since its inception. I congratulate the management and faculty whose undivided attention and profound dedication towards nursing this Institute in its nascent stage has been crucial for the management programmes to commence and gain momentum. I am very happy that IIM Lucknow played the role of a mentoring institution and I compliment the team from IIM Lucknow which was involved in the setting up of IIM Kashipur. As the youngest of IIMs, IIM Kashipur should strive to build a unique image for itself, while maintaining the high quality that IIMs are known for. I am happy to know that IIM Kashipur is considering the setting up two Centres of Excellence, on Sustainable Development and on Competitiveness. I am sure these Centres will stimulate new thinking, research and practice in their focus area. Many have felt the need for a renewed focus by our management institutions towards courses on entrepreneurship. At a time when IIM Kashipur is consolidating its course structure, it should leverage this opportunity and design management programmes in a manner that will become a model for others to follow. The unique geography of your Institute’s location, in an industrial belt surrendered by a predominantly rural area, provides you the opportunity to develop ‘extension education’ courses. Students should be encouraged as part of their academic curriculum to contribute to positive social development by helping people of the region learn better ways of running their farms, small businesses and other community ventures. This will instill in the students a sense of obligation to society, which they carry with them throughout their professional lives. I am confident of your Institute becoming a premier source for highly trained managers, a catalyst of entrepreneurship, and a resource hub for socio-economic development. We need a strategy to make the Indian Industry compete successfully with the best in the world. Skilled manpower has to play a key role in this strategy. A healthy growth of Indian business will be greatly facilitated by the availability of a competent cadre of management professionals. The pool of such professionals in our country is unfortunately not enough to meet the needs of our industry. The annual enrolment in commerce and management streams has increased from around 23 lakh in 2006-07 to around 34 lakh in 2011-12. The need for graduates and post-graduates from these streams will be much higher in the future and we must be ready to meet the demand. According to an international ranking of universities, no Indian university figures among the top 200 universities of the world. Our efforts must be aimed at taking Indian universities into the top-league. Innovation is also an important driver for growth. Unfortunately, we also lag behind our major competitors in this aspect. The number of patent applications filed in India in 2011 was about 42,000, which is far below the 5 lakh plus applications in both China and the US. A culture of innovation must be encouraged in our country and for that, we must create more opportunities for collaborative research, set up industry incubation parks in educational institutions and provide more research fellowships. Technology-based learning has great potential to increase the reach of education on the one hand and deepen the learning experience of students on the other. Benefit to students would accrue from knowledge and information sharing enabled by collaboration with other institutes through e-classrooms. 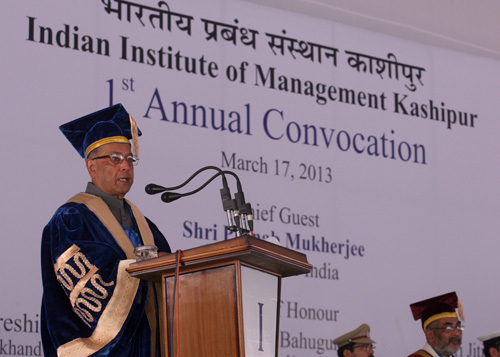 I am confident IIM Kashipur will be in the forefront of management education in the country. I have every confidence in your commitment and devotion and your ability to deliver quality management education. India today stands at the cusp of greatness- while there are many challenges ahead, there are also boundless opportunities. We are passing through a phase of unprecedented demographic change which is likely to contribute to a substantially increased labour force. The bulk of this increase is likely to take place in the relatively younger age group of 20-35 years which would make India one of the youngest nations in the world. In 2020, the average Indian will be only 29 years old as compared to an average age of 37 for China and the US, 45 for West Europe and 48 for Japan. It is clear that the youth of India, who are the leaders of tomorrow, shall aspire for higher standards of living, better service delivery and increased transparency and accountability. For India’s political and economic stability, it is important that we have truly "inclusive” growth - growth that benefits each and every citizen of the country especially those who are at the margins of society and at the base of the socio-economic pyramid. The challenges being large and diverse, India needs grass-root leaders who place people and their problems at the centre of the social, economic and political discourse. It is only when we work together and each Indian feels empowered to contribute to the task of nation building that we shall be able to combat poverty, malnutrition, hunger and disease. I call upon the faculty and students of IIM Kashipur to focus on the problems of the bottom of the pyramid and develop innovative solutions to address their concerns. On the eve of India’s 66th Independence Day on August 14th last year, I had observed that the glass of modern India is more than half-full. I had said that we are equal children before our mother; and India asks each one of us, in whatever role we play in the complex drama of nation building, to do our duty with integrity, commitment and unflinching loyalty to the values enshrined in our Constitution. If each of us follows this principle, I am confident that India will become a more vibrant, dynamic and prosperous nation. Dear students, the role played by alumni in the growth of leading universities across the world is well acknowledged. Alumni are active participants in the affairs of top universities in the US including Harvard. I hope that the students, who are passing out of this Institute today, and the others to follow in the future, will associate with their alma mater and contribute to its development in a meaningful and significant way. As you step into the professional world, you must remember that the potential for learning is never exhausted. Education is a life-long process. I hope that your studies here would have inspired you to seek knowledge at every stage in your career. I wish you good luck in your endeavours and the management and faculty of IIM Kashipur every success in the years to come.